Okay I am going to start this post with a thanks for all the help the people of this forum provided. I am immensely thankful for all the help and insights I got from my short stay here and I hope I contributed something as well. I am currently swimming in a heap of contradictory information regarding medieval warfare and early modern warfare. Something I have heard being said time and again was that the medieval heavy cavalry was only decisive on the battlefield. Modern scholars and 16th century warfare manuals all seem to agree on one thing, namely that warhorses (chargers) deteriorate when used for light cavalry duties (foraging, scouting and escorting). Now to what extent they deteriorate I do not know, I am not a horse person but from what I gather it makes the horse less than suitable for when the day of battle arrives. What we know is that the Medieval Man-At-Arms and the Polish Hussar both were recruited in units of lances. The size and composition of these lances seem to vary but what is shared between the two is that it's build around a heavy cavalry unit with personal attendant (valet) and light cavalry or mounted infantry. During some periods the number of horse outnumber the men in a lance, because the heavy cavalry person has a riding mount and two warhorses/remounts. The fact that a separate horse was used for riding seems to confirm what was said above regarding the deterioration of a warhorse when used for anything other than battle. 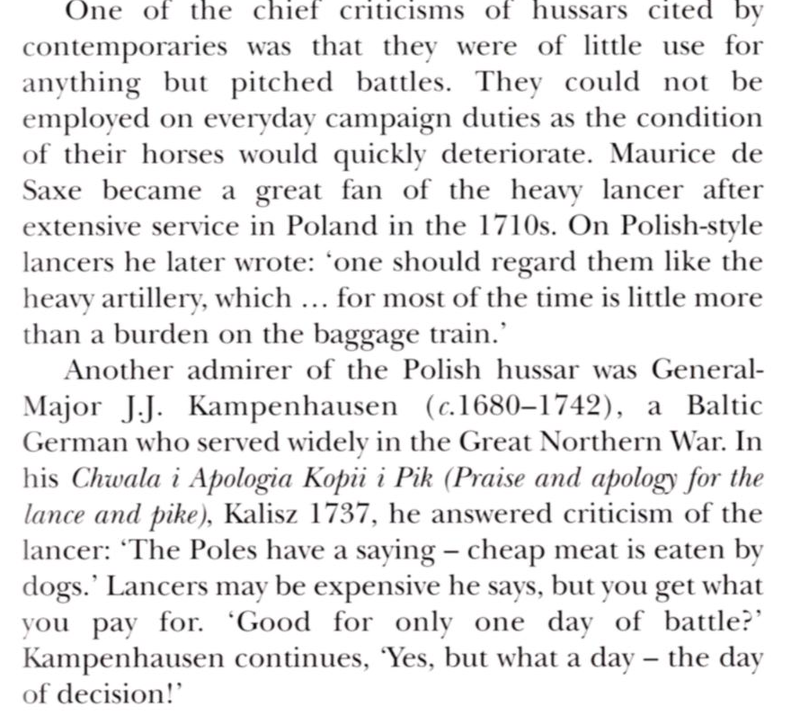 Another quote from an Osprey book on Polish Hussars. Now I am not certain whether I can compare the Polish Hussars to the medieval Man-At-Arms but the similarities in both recruiting and fighting is striking. So far so good I'd say, in both cases multiple horses are brought along by the heavy cavalry unit to spare it for the decisive charge on the battlefield. However this is where contradictory information starts to become appearant. A lot of chronicles and memoirs from the period of the Hundred Years War and the Italian Wars describe a lot of Skirmishes and sieges and relatively view set piece battles. Froissart mentions a lot of these small skirmishes. The details are again supplied by Froissart, who was clearly fascinated by small-scale conflicts, especially where the actions of individuals were seen and recalled by participants on both sides. Gautier Hewit with his mounted force of 50 men-at-arms and 20 archers had made camp outside the seemingly harmless fortifications of Oulchy. But these walls hid about 120 men-at-arms who had apparently assembled quietly, perhaps during the night. Bayard in his memoirs (or better said those of his loyal ally) is also full of these really small scale conflict. Others that spring to mind are written about by Philippe de Commines. What I read in those memoirs was that sometimes it was an ambush and other times two parties of mounted men just stumbled onto each other by chance. Where they riding their chargers in these small scale conflicts? They engage in battle quite readily and are fully armored when they meet the enemy. Did they engage the enemy on their riding horses or did they ride on their battle horses? Should I read the quote above as 50 men-at-arms riding with valet who brings the charger with him? The point am I trying to make is that it seems rather contradictory that they bring along horses only suited for set piece battles while engaging in small (seemingly chivalrous) battles all the time, effectively acting as light cavalry in some cases. This ties together with the other two things I can't really grasp, namely the English Chevauchee's and the whole living of the land strategy/supply system to frequently mentioned. The goal of these Chevauchee's was to devastate as much land as possible and possible draw out the French in open battle where they could be beaten. I've read the book on the Great Chevauchee by David Nicolles and he mentions a baggage train traveling with the army to collect all the booty. So even while the entire army was mounted they only covered 15 kilometers a day. He says that during the day a group of mounted soldiers would ride out to a maximum of 25 kilometers from the route the baggage train took, raid some villages and then make a return trip rendezvousing with the baggage train who traveled 15 kilometers during the day. Parties would be send out to either side of the baggage train effectively creating a 50 kilometer wide trail of destruction. Again all this riding seems and awful lot to ride on a warhorse, a significant group of Man-At-Arms went along with this great chevauchee, I doubt these went along just for the off chance they provoked the French into fighting a set piece battle. What I am having trouble with is trying to place the Man-At-arms into a category, it doesn't seem they were hit or miss, one chance weapon you use only rarely. But on the other hand I don't see how they fought so far and wide in small skirmishes that Napoleonic era heavy cavalry would avoid. The last thing I don't really get is this whole living of the land thing. Is it a myth or is it truth? A lot of mentions are made of baggage trains and not bringing a few carts along would hardly speed an army up. Did medieval armies truly walk into enemy land with nothing but the food they could carry? Did they cart everything along from beer to grain to fodder for the animals? Or did they perhaps bring along some stuff but replenished their stores at every opportunity? If so, would this slow an army down at all? I see it mentioned from time to time that medieval armies traveled slowly because they had to live of the land, couldn't this be easily averted by traveling along rich farmlands where there is a village every 3 kilometers and having a few mounted infantry groups raid the countryside a few miles from the main army? This held true for most of the Middle Ages, in fact. Try checking out John Gillingham's papers and dissertations on medieval English warfare; the De Re Militari site used to have some of them available for free, but I don't know whether they have been restored since the last major crash and rebuild of the site. One thing we know is that medieval men-at-arms were a multipurpose troop type; they weren't like 18th- or 19th-century cuirassiers who were highly specialised for the shock role. The average man-at-arms probably spent more time in the light cavalry role than the heavy cavalry role that dominates their image in their modern mind. We often don't know exactly how they pulled this off, however, since there are several possible methods and it is very likely that different military outfits favoured different methods. For example, it is by no means unlikely that at least some medieval men-at-arms were capable of fighting on their long-range riding horses; in fact, it is possible that Fiore's mounted combat section was intended to show how to fight on an ambling/pacing horse that a man-at-arms would have been more likely to ride in day-to-day civilian life -- or, indeed, long-distance travel between battles. On the other hand, it's also far from impossible that a man-at-arms would have owned (and marched with) more than one "light" horse -- a palfrey that provided a more comfortable ride for long travel and a trotting horse that would have been faster at the canter or gallop (and thus more suitable for the role of a "quick reaction force"). This might involve the need to dismount from the ambling horse and mounting up onto the trotting/galloping horse, which brings us to the question of whether the man-at-arms might have chosen to mount the "heavy" destrier/charger altogether. Changing horses was definitely not impossible if there was enough time to prepare, especially when the troop had good lookouts/scouts that managed to detect the enemy well in advance (thus preventing the enemy from overwhelming the unit with a surprise attack while the men-at-arms are dismounting and remounting). On the other hand, it is also possible to maintain a reserve of men-at-arms already mounted on their chargers and moving at the slower pace of the main body or baggage train. These reserves would have gone into action only if one of the faster raiding detachments got into trouble that it couldn't handle on its own and sent a messenger to summon the reserve's help. I don't think I can point out to any primary-source examples for this practice in the Middle Ages or the Renaissance, though -- it's just what makes sense when we extrapolate modern security detachment tactics and procedures to what a particularly good medieval/Renaissance cavalry unit might have done. It's also worth noting that medieval chargers might not have been as "heavy" or as specialised as later heavy cavalry horses would become. Even if some of them were very similar to the "heavy warmblood" breeds employed by later cuirassiers and horse grenadiers, appropriate training could have made a considerable difference to the horses' agility and endurance; Louis Nolan famously complained that his English hunter could jump fences with ease while Austrian horses of similar size and conformation had to go around and look for a gate because they had not been trained for cross-country pursuits. I doubt it would make any sense that the entire army's cavalry component would have been out riding back and forth with the roving bands. There must have been a main body marching with the baggage train both to protect it and to provide a handy reserve should any of the roving detachments encounter any opposition too strong to be overwhelmed or avoided with its own resources, and the distance between the roving bands and the main body should have provided the necessary time for these reserves to prepare (including mounting up the men-at-arms on their chargers/destriers if necessary), at least if a messenger (or some sort of prearranged signaling system) could get the news back to the main body in time. Even in the individual roving band, it's very unlikely that the whole raiding detachment would have ridden together in a large amorphous blob since that would only invite ambush by the enemy (though it's by no means impossible, especially if the band was largely made of inexperienced men and had a similarly inexperienced leader). It's much more likely that reasonably experienced roving bands would have organised themselves with a main body serving as the local/immediate reserve as well as several scouting and security detachments that would have been tasked to gather information and shape the enemy's behaviour should any be encountered (say, keeping the enemy under observation if they managed to detect the enemy without being detected themselves, and perhaps even find out concealed routes of approach that would allow the main body to launch a surprise attack -- or, if the enemy detected them too, they could engage in some posturing to discourage the enemy attack altogether or at most fought to delay the enemy's attack so that the rest of the roving band would have been able to prepare and organise properly for a fight). That's because the medieval men-at-arms were an inherently multirole force; they had to be capable of acting as heavy cavalry, light cavalry, or heavy infantry depending on their situation. This was (at least in theory) why they required so much equipment and training, and why they were viewed as elites that were very difficult to replace when lost (unlike Napoleonic heavy cavalry, which was often viewed as being rather expendable from a tactical viewpoint -- commanders were willing to accept heavy or even crippling losses to their heavy cavalry if the attack would inflict even more significant damage to the enemy). And even Napoleonic heavy cavalry was not always as stereotyped as the formal manuals and regulations stated; the British in particular made little distinction between the two types, since their light cavalry also had to be able to effectively mount massed charges while their heavy cavalry often had to engage in outpost duties since there were no other forces available for the role. Even continental powers had dragoons, which were usually trained to act as heavy cavalry when they fought in their mounted role (i.e. fighting in large, dense masses), but were often sent out to hunt down guerrillas or patrol supply and communication routes since they were seen as being more "expendable" than more prestigious types of "real" cavalry. The last thing I don't really get is this whole living of the land thing. Is it a myth or is it truth? A lot of mentions are made of baggage trains and not bringing a few carts along would hardly speed an army up. Did medieval armies truly walk into enemy land with nothing but the food they could carry? Did they cart everything along from beer to grain to fodder for the animals? Or did they perhaps bring along some stuff but replenished their stores at every opportunity? If so, would this slow an army down at all? A mixture of both, as a matter of fact. Some supplies (food, water, animal fodder, perhaps even common materials such as iron for nails and horseshoes) could be replaced from local sources, but some others (bowstaves, armour, ammunition, gunpowder, artillery trains) generally had to be carried along from the start to the finish of the campaign. There's no such thing as purely living off the land or purely relying on the logistical supplies the army could bring along (except for extremely short raids/campaigns); practical logistics involved finding the right balance of local and centralised supply, and in some cases this required the established of protected/fortified logistical depots in the midst of "enemy" territory. I see it mentioned from time to time that medieval armies traveled slowly because they had to live of the land, couldn't this be easily averted by traveling along rich farmlands where there is a village every 3 kilometers and having a few mounted infantry groups raid the countryside a few miles from the main army? No. The slowness of the baggage train wasn't only due to the need to forage for some supplies. For one thing, starting a march often took a considerable amount of time -- breaking camp, getting the marching column organised, getting it moving, making sure that nothing or nobody of any importance was left behind, and all that kind of stuff. Ending it wasn't a simple matter either -- performing accountability that nothing or nobody had been lost along the way, laying out the camp and assigning parts of it to the relevant subdivisions of the army, setting up guards/sentries and patrols, and so on and so on. Not to mention halts in the middle of the march to give the members of the marching column some opportunity to rest and restore the column's organisation. Even when the countryside is rich and dense with resources, ransacking each village and loading up its supplies to the army's means of conveyance (pack animals, wagons, human porters, whatever) would have taken a substantial amount of time, more so if the supplies had to be collected and distributed in an organised manner (rather than let everyone take anything and everything he/she could carry, which might lead to jealousies as the rear of the marching column would only be left with the sad remains of the forward unit's ransacking activities). Logistics and marches are hugely complicated subjects, which is why it takes years to study them properly in modern military academies and training programmes -- an even then it takes a long time to learn the ropes in field practice before soldiers and units become reasonably proficient at it. Medieval and Renaissance armies faced similar difficulties but often lacked a unified and uniform logistical theory or doctrine, so you can imagine what kind of nightmare that can lead to even if individual units' or subdivisions' logistical habits or practices worked well enough for its own purposes. Thanks for the incredible comprehensive reply Lafayette, after reading the Livejournal bits and de re militari site I noticed that I still have a lot of reading work to do. The idea that medieval man-at-arms were truly multipurpose troops would indeed explain a lot of the things I could not grasp. It is also quite likely that the medieval man-at-arms has a lot more resources at his disposal to fulfill multiple combat roles when compared to 18th or 19th century Cuirrasiers who were conscripts or volunteers. I would really like to learn more about how they performed as multipurpose soldiers, sadly it seems no one wrote down what horse they mounted for what duty or whether they rode a single horse for multiple types of combat. Perhaps someone with experience could tell me how hard it is to ride a riding horse into combat or how hard it is to train a light cavalry horse. If the man-at-arms did indeed fight on a light horse from time to time, what breed would it be and would it also carry the rider in full armor or might he dispense with some less essential armor? The whole logistics side of warfare does indeed seem like a huge object of study which I will look into later. This makes me wonder about food production and portability in the middle ages. I think that would add allot to this discussion, because living of the land, raiding and foraging, involves degree of risk, not finding food, getting in fights with farmers, villagers spreading army to thin etc. Having bunch of food stocked and transported and solely carries it own set of risks. slowing the march down, potentially leaving the exit city more vulnerable to famines, and rotting or lost. I think having understanding what medieval food preservation and storage was like could do great deal to answer how extensively they relied on raiding or set up supply lines. David Nicolle's work is fine but the distances and general ideas of how it worked are just that, general. There is a heck of a lot of variation and factors involved, lie and condition of the land, natural and artificial barriers, weather, available forage, condition of horses, location of enemy and allies etc so that 50km swathe of raiding territory is a pretty simplistic. Does depend on what you mean by 'living off the land' too. Thats relatively easy for the mounts, given even the most meagre vegitation, but not for the humans. If we assume that people will carry a small amount of rations for themselves (and the horse too if possible) then they will still, very quickly, need to get more supplies. Its unlikley to be acquired in a 'backwoods' fashion, it will pretty nearly always be got on a beg, borrow, buy or steal basis from the locals, not all of whom will be entirely hostile. I know nothing of the earl, formative, hussars but there is a great welath of info regarding keeping an army on the move in the late 18th and early 19th cent, all well worth a read. Notes: It is written by an officer in the Staff Corps Regiment of Cavalry, yet his duty was primarily as a commissary officer. Great descriptions of Almeida and buying cattle for the army. Notes: Served in the Peninsula from 1811 - 1814; Waterloo. Was initially on the Army staff; transferred to 3rd Division in early 1813; assigned to 7th Hussars for 1815 Campaign. Ludovici, Anthony (Editor). On the Road with Wellington: the Diary of a War Commissary in the Peninsular Campaigns New York: Alfred Knopf; 1925. 440 pages. Notes: Author was August Ludolf Friedrich Schaumann; served in Peninsula from 1808 - 1813; at all major battles including retreat to Coruna; served with 1st KGL Hussars in 1810; 7th KGL Infantry in 1811; 9th Light Dragoons in 1812; 18th Hussars from 1812 - 1813. Get J.F. Verbruggen's The Art of Warfare in Western Europe During the Middle Ages. More than any other book I've read, it has helped me get over the need for oversimplified models or explanations in understanding medieval European warfare. I got it from my Uni's library not long ago and I am currently 100 pages or so in the book. It is very helpful indeed, sadly I cannot read it in my native Dutch due to it being the older print. I have one more question regarding the deterioration of horses, when would this happen? Is it related to less than adequate food intake during long rides associated with long rides for skirmishing or a horse forgetting its training when skirmishing. If I look at modern ratios suggesting a horse should carry no more than 20% of it's body weight than a horse between 1200-1300 pounds would carry an armored knight with tack all day long right? I'm thinking.. Chargers and heavier type horses were trained to quite a high degree, so what horses learned during training might be lost if they were used for scouting as this, the way I see it, is pretty different from charging into the enemy. The other thing I guess is conserving energy. When a charger was needed it had to be as fresh as possible, and you don't get this if you have been riding it all day. And on the topic of ambushes, I guess that is a pretty similar thing. I suppose a charger was trained to start the attack quite similarly - slower at first and then speed up and crash into the enemy. And the ambush doesn't allow such movement, so I guess it was even prefered to not use a highly trained horse for something he was not trained to do. This would mean that they might have just used their riding horses. I'm assuming so because, as far as I know, modern jousting horses are also trained just to charge down by the fence and stop at the end. Doing other things as well would just mean distractions from what a horse is trained to do. I hope I'm not completely wrong here, it's just what came to my mind.